Jessica Kalb enjoys “kangaroo” bonding time with her triplet daughters. It had been 18 long months of fertility treatments with no success for Jessica Kalb and her husband, Justin. But at the last treatment, doctors discovered two viable embryos and implanted them in Jessica’s uterus. 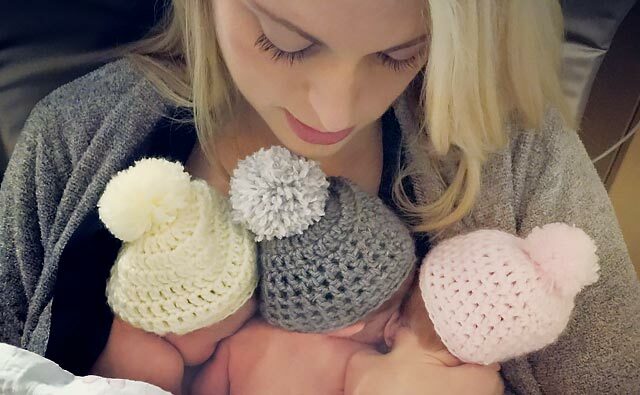 At her check-up the following month, the couple got the surprise of their lives – Jessica was pregnant with triplets – all girls! “We were a little nervous at first, but we were also excited!” says Jessica. Her pregnancy went smoothly, and Jessica went into labor on her own at 32 weeks. The babies were safely delivered on February 15, 2015, via C-section at Summerlin Hospital, ranging between three and three and a half pounds each. NICU Clinical Supervisor Jennifer Hufano, RN, says they started a campaign promoting kangaroo care after learning about the benefits. “As soon as the baby is stable enough, parents can hold them skin-to-skin. This type of contact between parent and baby has been shown to improve the baby’s vital signs, keep their temperature and blood pressure stable, and provide valuable bonding time,” says Jennifer. The babies stayed in the NICU for five weeks. Once the triplets were off the tubes, Jessica was able to “kangaroo” with all three babies at once. The girls, now almost nine months old, continue to thrive and are over the 100th percentile on the preemie growth chart. For more information about the NICU, visit The Birthplace at Summerlin Hospital.